Wanderlust (n): A strong desire for or impulse to wander or travel and explore the world. Alyssa is a visual storyteller who strives to capture the beautiful experiences she encounters. This is her journal documenting her adventures as she strives to satisfy her unrelenting wanderlust. There is no better travel than time travel. Visiting these two sites will absolutely bring you back to your childhood and fill you with nostalgia. I posted about these la jolla swings when I first started this blog here, but I didn't have any details on how to get there. So this post will cover not only details about how to get to the swings but a newly added treehouse as well! From Torrey Pines Rd, turn left onto La Jolla Shores Drive. After about 1/4 of a mile down start to look for parking preferably near UCSD Coastal Apartments. Once parked walk along the UCSD apartments until you see Discovery way or this blue sign. Make a left at Discovery where you see the fire hydrant and blue banner and then cross the street. After you across the street you should have in front of you metal poles. Once you walk past these look to your right and tada! 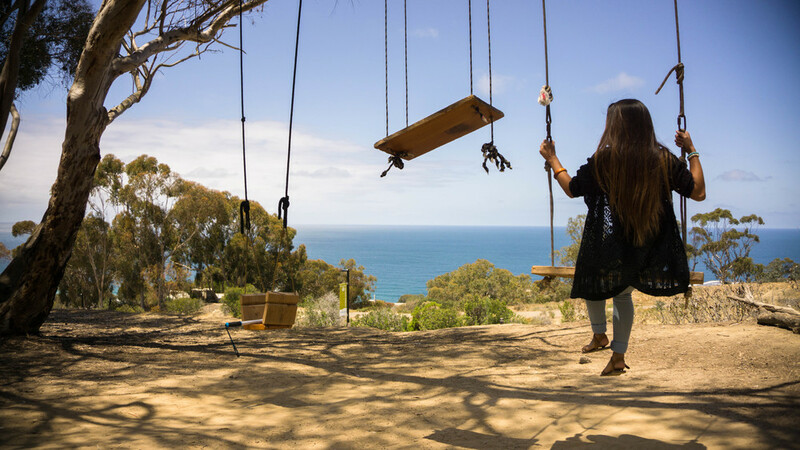 You have the awesome tree swings overlooking La Jolla. Amazing views of the La Jolla Shores! A year ago when I came to this spot it was just the tree swings. But recently a treehouse has been added nearby that also overlooks the La Jolla Shores! All you have to do is keep walking straight past the swings towards the Birch Aquarium and you will come across it. This spot also offers an amazing view of La Jolla Shores! The vibe up in the treehouse was so chill and relaxing! I could honestly stay up there for hours. I think this treehouse is still being developed so there wasn't too much space up there. Vanessa and I are both pretty small so we fit comfortably on the platform. This is hands down one of my favorite chill spots in San Diego! I honestly feel like a kid again when I come here and it literally takes all the stress away. It also offers the best breeze in the city! Definitely a must on your list of places to check out. Be sure to allow yourself plenty of time because I guarantee you won't want to leave!